The patio beside the house is used as an outdoor room. The stone paving has been re-laid in an attractive flagstone arrangement. A simple pattern of clay brick pavers makes the space feel larger. 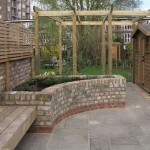 It includes a semi-circle detail which links with the arc of a new raised brick planter. This curve softens the patio edge, and encloses the space. 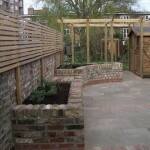 The area is screened with cedar strip lateral trellis for privacy. The paving continues as a short section under a pergola. This has been planted with climbing roses, and a scented evergreen jasmine. In time, these will screen the patio area. 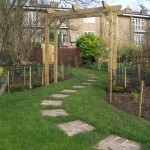 Beneath the pergola is a thyme lawn, edged with clay pavers. The climbers are underplanted with Nepeta and Achillea. 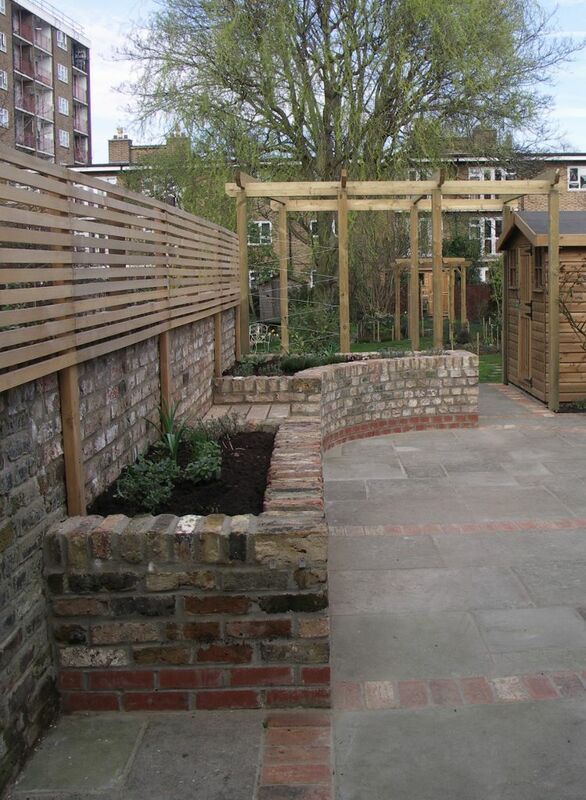 The pergola frames a small cottage-style shed items used on the patio. 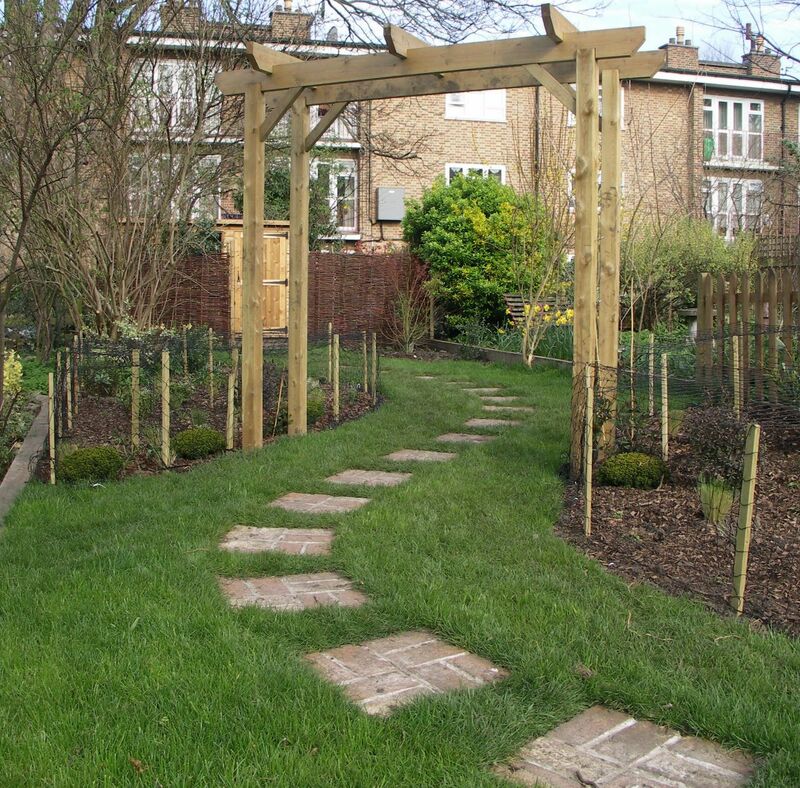 A path of brick paver ‘stepping-stones’ invites us through the lawned area in a gentle meander past a willow tree. Large curved borders are planted on either side. 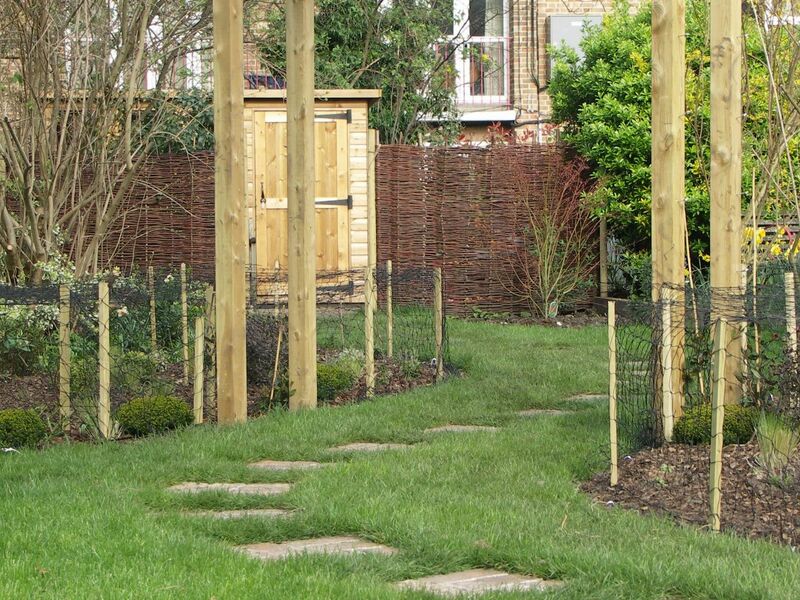 The boundaries are mainly open to the adjacent gardens with a stretch of low palisade fence. This gives the garden a spacious country feel, quite different to a long narrow garden in London. Until the plants are established, the borders have been protected with netting as there are several foxes who like to visit. The path finishes at the paved work area with a large shed for storage. 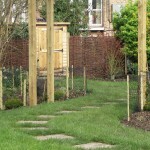 The work area s attractively screened with willow hurdles which fits the country-style of this part of the garden. 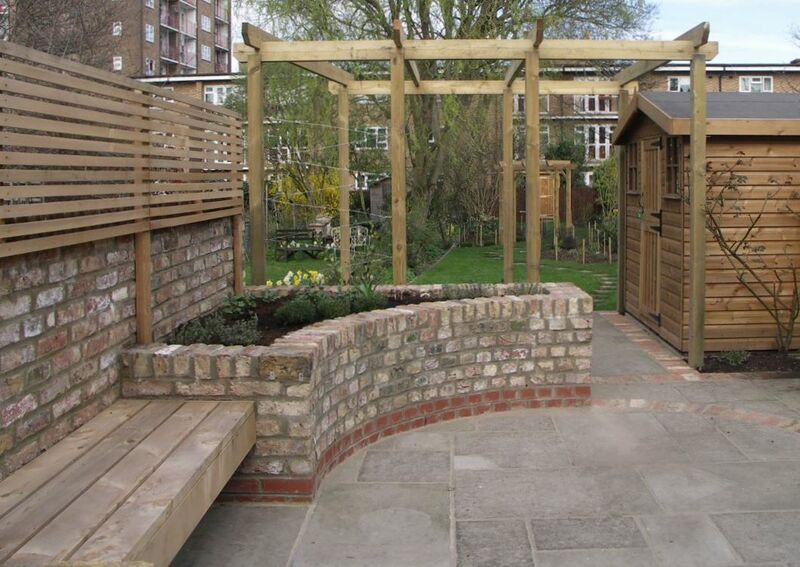 This entry was posted in Long Narrow Gardens and tagged brick pattern, Cedar bench, Cedar Strip Screening, Clay Pavers, Cottage-Style Shed, curves, Garden Design, Leaf & Acre, Long Narrow Garden, North London, patio, Planting Design, Raised Planters, stepping-stones, Stoke Newington, wavy path, Willow Hurdles on May 11, 2014 by admin.